Filter RC PES SFCA NY "PTFE"
Syringe filters with high burst strength for assured performance. Manufactured to ISO 9002 and GMP standard and 100% integrity tested. 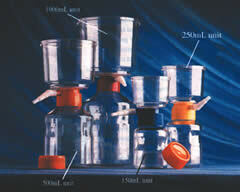 Syringe filter sizes include 4, 15, 25, or 26mm diameter to handle volumes ranging from 0.5 to 100 ml. The 50mm diameter "PTFE" syringe filter are ideal for protecting the vacuum line and pump. These disposable filter units are ideal for tissue culture media, buffer solution, stain solution, biological fluids and most other aqueous solutions and reagents that are used daily in the EM lab. Pore size and membrane type are printed on every syringe and the filters are certified non-cytotoxic and non-pyrogenic. Syringe filters are individually blister-wrapped in cases of 50. The 50mm "PTFE" syringe filter is supplied in a case of 12. * Not HPLC certified, but still sterile. Vacuum filtration units fit standard threaded bottle tops. Designed for use on glass or polystyrene media bottles. The unit includes membrane filter, glass fiber pre-filter and graduated funnel of clear polystyrene with polyethylene neck adapter. Attaches to most popular 33 and 45mm diameter bottle's necks with standard GPI threads. Systems are individually packed, gamma irradiation sterilized and certified non-pyrogenic. Comes with tubing adapter that fits most vacuum hoses. Units are color coded by membrane type (CA: Orange; NYL: Red, CN: Blue; and PES: Yellow). These tubes minimize unnecessary transfer by filtering directly into the centrifuge tube. Each case comes with two centrifuge tube stands. The polypropylene tube is supplied with an individually wrapped cap for storage. Individually packaged, sterile, certified non-pyrogenic. These filter units have a low center of gravity and wide base for stability. They have a separate pour spout to remove filtered sample which minimizes contamination. Individually packaged, sterile, certified nonpyrogenic. Disposable polystyrene bottles for the storage of media, buffers and other aqueous solutions. Easy grip sides facilitate handling. Plug seal cap provides an airtight seal and helps minimize the risk of contamination. Sterile, certified non-pyrogenic. Neck size 45mm. Available in 33mm and 45mm neck sizes. Connector neck with unique polyethylene gasket ensures a positive seal between filtration unit and collecting bottle. Funnel has tubing adapter that fits most vacuum hoses. Units come individually packaged and are pre-sterilized by gamma irradiation, certified non-pyrogenic. Prefilters included. Fiberglass pre-filters for use in Bottle Top and Vacuum Filtration Systems above. Recommended filter size dependant on apparatus used. The Pre-Filters are available in two sizes: 50mm and 70 mm diameters. Spin-X centrifuge tube filters utilize centrifugation for the filtering of small volumes. The unit consists of a polypropylene filter insert and a centrifuge tube. It handles volumes up to 500µl. they have a cellulose acetate membrane for aqueous solutions which is ideal for the removal of bacteria, particles, and cells from media. They are also effective for DNA removal from agarose or acrylamide gels. Spin-X LC units have a nylon membrane for applications such as HPLC sample preparation. Both have retailed volume of <5µl, and withstand relative centrifugal force (RFC) to 16,000xG. Cellulose Acetate membrane with 4mm diameter Poly-propylene housing with 7mm2 filter area. This 1ml syringe filter is very useful in sterilization of micro/immunlogical reagents, enzymes, antibodies and immunolabeling. Non-sterile, bulk pack: 100/pkg, 400/case, autoclavable. These high quality disposable rubber piston syringes offer substantial savings. A lubricated synthetic rubber piston allows for a smooth draw while a positive stop prevents accidental pull out. Bold graduations are easily read and resist wipe-off. Syringes are ETO gas sterilized, latex and pyrogen free. 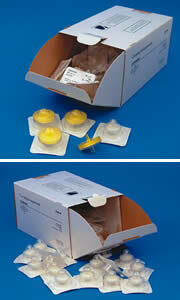 All syringes are packaged in individual sterile strip packs. These syringes are latex free; contain no rubber, no silicone oil or styrene. They are the choice for any situation needing an inert, hypoallergenic syringe. Because of their purity, they are indicated for IVF, embryo transfer, chromatography and many laboratory procedures. Manufactured only from laboratory grade polypropylene and polyethylene, these unique plastic syringes have a positive safety stop to prevent accidental spills. These syringes are individually sterile strip packed. Sterile. Disposable. Plastic. Transluscent Hub. Surgical Stainless. Color Coded. One size fits-all syringe caps that can be used with either a luer slip or luer locking syringe tip. These tips make the syringes suitable for usage as embedding media storage vessels. These sticks are made from closed-grain Northern White Birch. This selective wood provides a smooth, splinter-free finish with good tensile strength. In addition to medical uses, these sticks are ideal for spreading ointments and salves, stirring and mixing etc. Manufactured from closed-grain Northern White Birch these sticks are ideal for use in specimen transfer, as a mixing rod, and for general laboratory applications. Orange Sticks are 7 inches long and 5/32" diameter, choice of beveled ends. 6" Cotton Tipped Applicators, Choose from different cotton tipped sizes. Tips are specially processed to resist tears and pulls and leave your cleaning environment virtually lint-free. 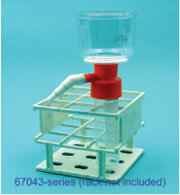 Available with a wooden shaft or a polypropylene shaft. Tips are made from shred-resistant, 100% urethane foam with 100PPI porosity. Except where wood is noted, all shafts are polypropylene. Newly introduced PurSwab Popule, which is filled with 91% isopropyl alcohol and 9% deionized water. Simply squeeze the handle to break the patented seal and allow liquid to flow to the foam head. The tips on these applicators are specially designed to withstand many of the chemicals and solutions commonly use in labs and clean rooms. Tips are resistant to deterioration – they won'’'t swell or break apart. Choose from swabs that feature an antistatic foam head – or swabs with completely static-free construction. Static-dissipative swabs attract dirt and dust for easy cleaning, while reducing and dissipating static electricity. Antistatic properties will not decay over time. Swabs meet all industry standards and requirements, including ASTM-D257 and Federal test method 4046, standard #101C. Economical general purpose swabs. Best solvent retention. The most cost-effective swabs for general purpose applications. 100 ppi reticulated medical grade foam provides excellent particle entrapment. The open cell structure gives the best solvent holding ability of any style of swab. These swabs are free of adhesives or binders that could contaminate your process. Fiberless construction does not generate particles. Round Tip. Economical general purpose swabs. Best solvent retention. The most cost-effective swabs for general purpose applications. 100 ppi reticulated medical grade foam provides excellent particle entrapment. The open cell structure gives the best solvent holding ability of any style of swab. These swabs are free of adhesives or binders that could contaminate your process. Fiberless construction does not generate particles. Pointed Tip. They are round and double tapered; used for cleaning pole pieces and parts of the EM. Also used for oreinting the specimen during the embedding stage.